In the last few weeks I’ve visited two stately homes, Castle Howard near York and Hampton Court in London. Mum and I stopped in at Castle Howard on our way back down to Cambridge after two days in Edinburgh. We arrived quite late in the afternoon – in fact 15 minutes before their last entry time to the inside of the house. We bought our tickets and raced up the driveway to see an extremely imposing sight. Castle Howard is interesting on a number of levels. I’d been reading about its history in Bill Bryson’s book, At Home, as it was built to the design of a man named Sir John Vanbrugh who was commissoned by the Earl of Carlisle around 300 years ago. It is one of the largest private homes in the UK. The most astonishing thing about Sir John is that, prior to Castle Howard, he’d never designed a building before and was in no respects an architect. In fact he was a playwright and the wikipedia article on his life is quite interesting. The Howard family still live in the enormous building (I think there are over 200 rooms), in one wing, and some of the rest is open to the public, although as with Schonbrunn Palace in Vienna, not quite enough of it to feel that you’ve had value for money. 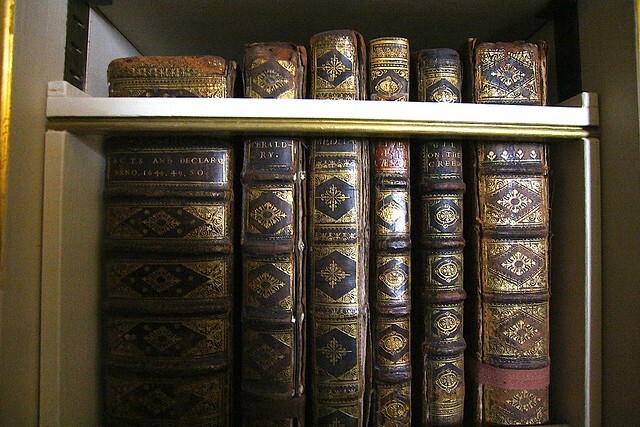 Some books from the castle library – the one on the left is dated 1644. Part of the interior of the building was damaged by fire in the 40’s and the process of rebuilding is happening very slowly. You can go into the burnt-out rooms and they are currently being used to display photographs of Brideshead Revisited, both versions of which were filmed here. The most outstanding features of the castle interior are the frescos, painted by Giovanni Antonio Pelligrini. In the main entrance hall and some of the unburnt rooms every surface but the floor is covered in completely over the top baroque artwork – flowing capes, naked women, battles and gods. It’s hard to imagine living with that kind of excitement going on around you day and night. 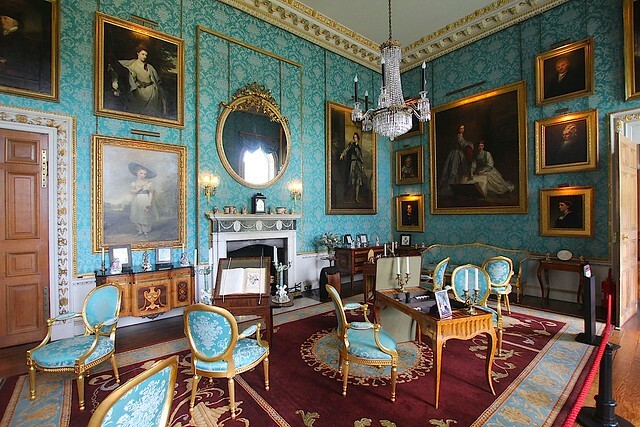 In the unpainted rooms there’s hardly less visual excitement with sky blue and gold fabric papering the walls, covering the chairs… it really highlighted how much tastes change over the centuries. If you decorated a house with even half the colour now people would look at you as though you were mad. Then again, if you hired a writer to design your multi-million dollar mansion you probably would be mad. 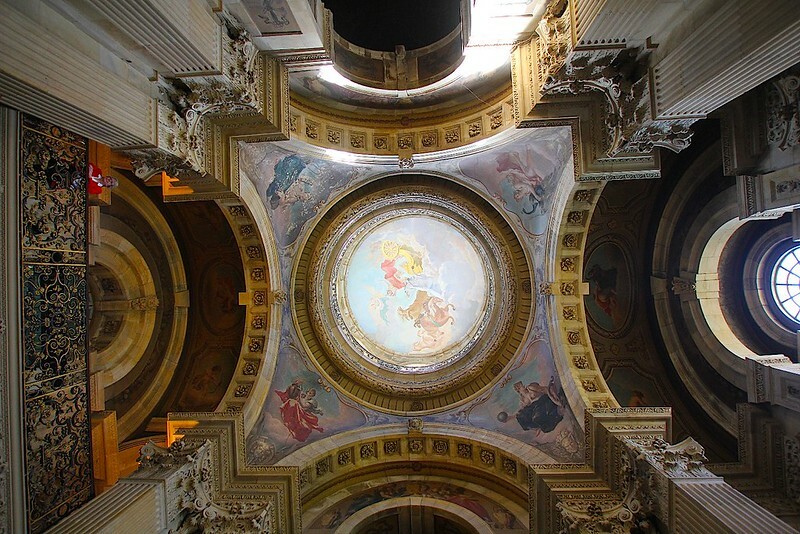 The ceiling of the entrance hall. One of the drawing rooms. 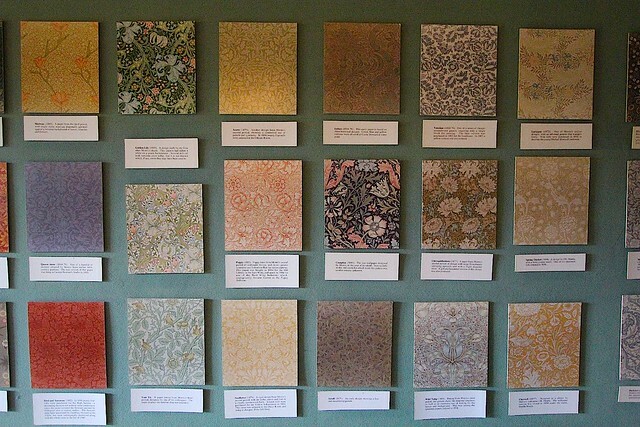 One of my favourite features of the tour was very small – a little display board devoted to the William Morris wallpapers one of the Lady Howards had used to decorate parts of the castle. I love the Art and Crafts Movement and it’s the first time I’ve seen some of these iconic prints in the flesh. Mum and I both quite enjoyed Castle Howard but if I went back I’d definitely take a picnic and make the most of the huge lawns and outdoor views of the building rather than rush through. Oh, it’s also worth noting that it’s not, in any way, a castle. 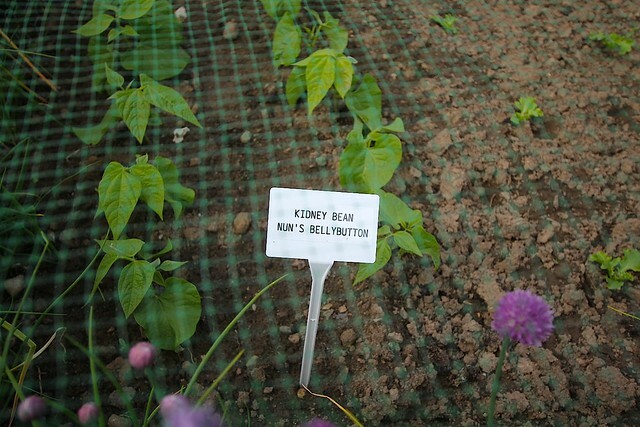 A sign in the garden… tee hee! For Mum’s last day in the UK Luke and I took her to Hampton Court. As with many of the things we’ve done, I had pretty much no idea what to expect before we got there. For some reason I expected something a little like Castle Howard but it was completely different. The Clock Courtyard. The fountain is designed to run with wine on special occasions. The core differences come down to two factors – age and use. Hampton Court is a mostly medieval building rather than renaissance, created primarily in the time of Henry the 8th and made of (rather ugly) brick. 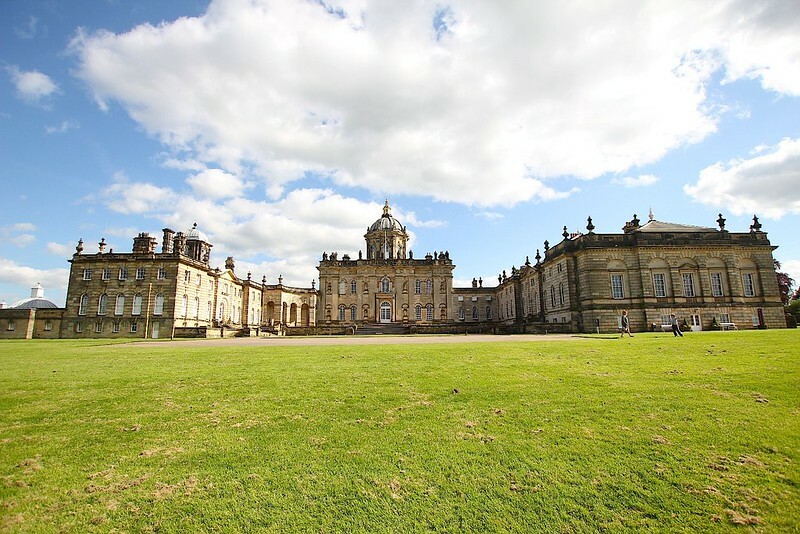 It is nowhere near as imposing or grand (in my opinion) as Castle Howard. It has always been used to entertain rather than as a primarily private residence. Most of the main building is apartments for royal guests to use. Even before it was bought and expanded on by the church it was a waypoint between the two main royal residences. There was an exhibition on while we were there – ‘Secrets of the Royal Bedchamber’, which, disappointingly, was nowhere near as salacious as you might hope and mainly revolved around the fact that the royals would often receive guests in their bedrooms. *yawn*. The two things I found most interesting about the place were the tennis courts – definitely go see them if you visit and read the panels along the wall. You can watch ‘Real Tennis’ (ie the original version of the game) being played by a few of the 500 current members and learn about the ridiculous wagers Victorians made over the game (one man won a match from the back of a donkey). The other thing I enjoyed seeing was the world’s oldest and largest grapevine. Planted in the 18th century and still producing about 1000 bunches of eating grapes per year, it is an astonishing sight. 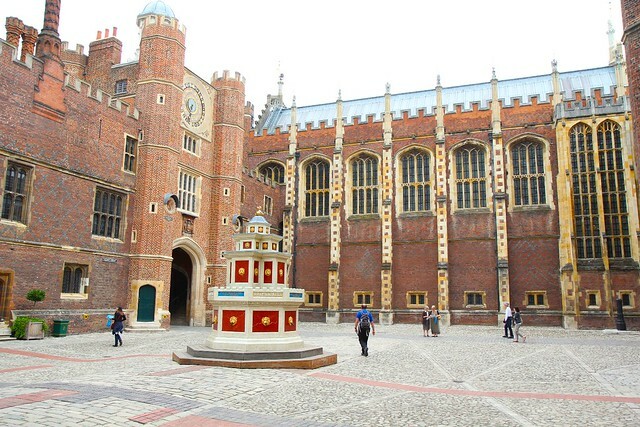 My tip for visitors to Hampton Court is to pass on a piece of my mum’s advice – make a meeting time and place when you arrive (if you’re with a group) because the place is a warren and, unlike most other similar buildings, there’s not one set route to follow. I lost Mum within 5 minutes and then Luke later on. We managed to meet up but then lost each other again. Having a meeting place also means that if one person wants to walk quickly while someone else wants to dawdle at a snail’s pace *cough*Luke*cough*, you can do what you like. 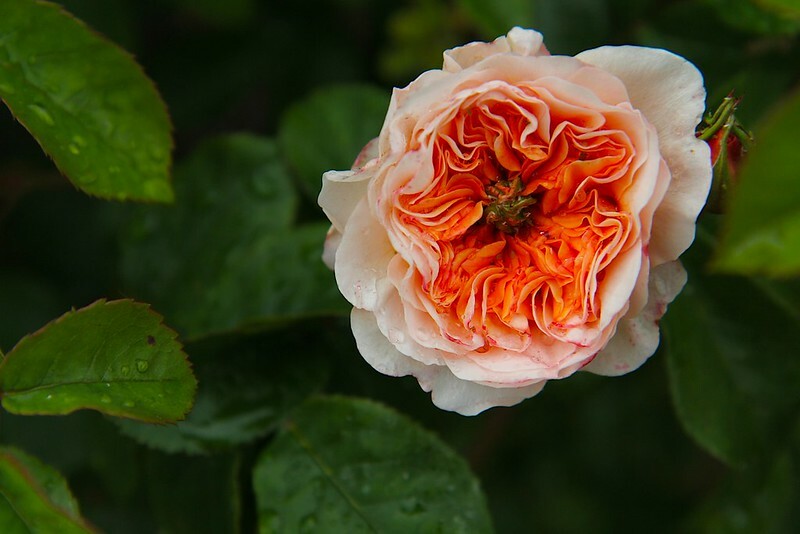 The scope and variety in the rose garden was staggering. The scent was divine. After Hampton Court we drove Mum back to her hotel in Heathrow and stayed to have dinner at the pub across the road before saying goodbye. 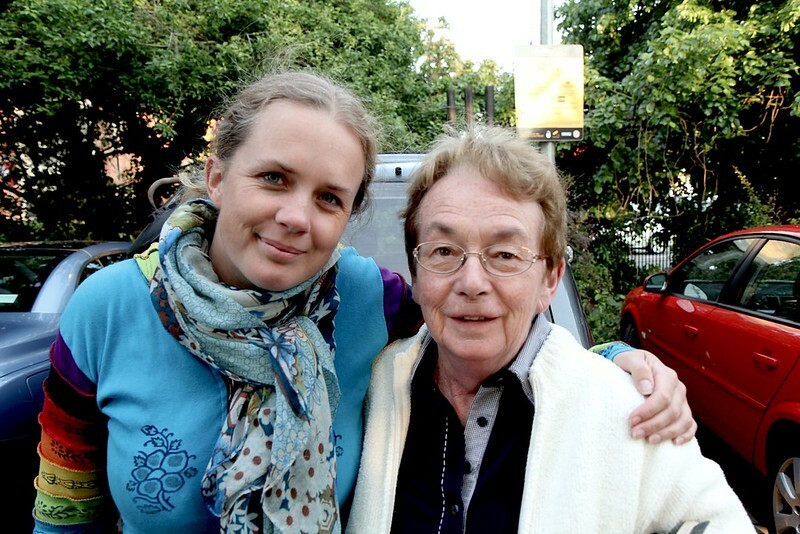 It’s been a really great month of traveling around with her and I miss her a little already – which is funny because I only see my parents for about a week out of every year, and even then I’m probably not in the same room for most of that time, so I’ve spent more time with Mum this month than in the last decade. When we drove away a whole bunch of things occurred to me that I would’ve liked to talk about with her. I’ll just have to wait til Christmas. Thanks for coming, Mum – and hi to the ladies at your hairdresser’s who I know will be reading this! « The Harry Potter Studio Tour plus our very first prize giveaway! Thanks for showing Hampton Court – it’s such an amazing place and often gets forgotten about! There sure was a lot to look at there, it was a shame it rained most of the because I’d have liked to have seen more of the gardens. That’s a shame, but did you get to see the famous maze? Shamefully, I must admit we did not! It was raining and I was in a cranky mood;). Is it a difficult one to get out of? My strategy is always to just follow one wall… which is very time consuming in a big maze but at least it’s infallible;). Ooh I just watched the more recent bride ahead revisited last week! It was ok.. I watched it for Ben Whishaw! Is he the new Doctor? I’m glad you got to Hampton Court but am sorry that you didn’t enjoy it as much as you’d expected to. If we’d still been there we would have made sure you would have had a much better time – it really is an awesome place! Sorry we weren’t there, it would have been lovely to see you again & to meet Luke & your mum! Ah, it wasn’t bad, just not great weather – which is to be expected, really. I did learn a lot though. And we spent a night out with Matt in Nottingham a couple of days ago which reminded me of you guys – the original reason I first came to Nottingham all those years ago:).